For a limited time, get $20 off an A/C recharge with coupon. Most vehicles are just $79.99 including refrigerant! Click the image above for your printable coupon. Routine Maintenance: Routine preventative maintenance of your vehicle can not only save you in fuel economy, but it can also help you avoid costly repairs. Check your tire pressure at least once a month to make sure they are inflated properly. Tires that are not properly inflated can lower your fuel economy. Checking your tire pressure is so simple, quick and easy, yet can save you money in fuel economy–also aiding in safety–so don’t neglect this important procedure! If you’d rather not bother with this chore, Einstein’s is happy to check and inflate your tires FREE of charge anytime! A dirty air filter restricts the flow of air into the engine–and when your engine needs about 9,000 gallons of air per each gallon of gas used, air restriction is a bit deal. Einstein’s technicians will show you your air filter each time you’re getting your oil changed. Make sure you have it replaced at least once a year–have it replaced sooner if it becomes clogged and dirty. Eagle Road Location NOW OPEN! The newest Einstein’s Oilery location off Eagle Road is officially open for business! 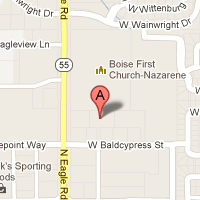 The store is located just north of Ustick next to Lowe’s behind the new Taco Bell (directions). Business hours are Monday-Saturday 8am-7pm and Sunday 10am-5pm. No appointments are ever needed! Store phone number: 577-6018. Click the map below for directions.